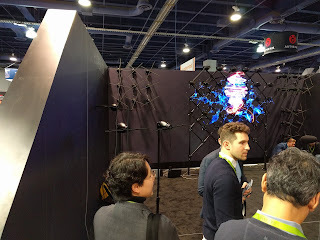 As I walked around the CES showroom floor today I got to see tons of cool stuff. Cool cars, cool drones, cool phones, but one of the coolest was a LED display that looked like was filled with fans or rotor blades. Hypervsn created a product that uses spinning blades and LED lights to project what looks like holograms on a wall. I have to say that it looked pretty good and caught my attention, but I'm sure it's not for any consumer use, especially since something would be needed to protect people from putting their hands in the blades. Check out my quick video here, or CNET's video here.